When business magazine Forbes Asia published its 2017 list of the Philippines’ 50 richest people in its September issue, it had a special feature on one of the list's veteran names: Betty Ang, the president of food manufacturing firm Monde Nissin Corp. But the feature was not about a recent company event or acquisition; rather, it focused on how there is little-to-no publicly available information on the tycoon. Ang, who comes in as the 20th richest Filipino this year with a net worth of $880 million, is one of the lesser-known names in the exclusive list. A quick look at Monde Nissin’s company website does not say anything about her or any of its board of directors. On the Forbes website, she is one of the few Filipino tycoons who does not have a photo on her profile page. “Even basic information about her is uncertain, such as her age,” said Jane A. Peterson in the feature, aptly titled “Shrouded in Secrecy”. Indeed, most of what is publicly known about her comes from Monde Nissin’s filings with the Securities and Exchange Commission (SEC). Its latest general information statement shows that Ang owns 24.85 percent of the company, making her the second largest shareholder. The largest stake belongs to Indonesian businessman Hartono Kweefanus, the chairman of the board who owns 27.95 percent of the shares. Forbes Asia reported that Kweefanus is the brother of Ang’s husband, Hoediono Kweefanus, who owns 3.1 percent of Monde Nissin. More than 70 percent of the company’s shares belong to Indonesian stockholders. According to Forbes Asia, the Kweefanus family is also the owner of Khong Guan Biscuit Factory Indonesia, an Indonesian food manufacturing firm established in 1970. A 2007 article on Indonesia’s biscuit industry described Khong Guan as the dominant player in the country’s canned biscuits market. Despite the lack of information on Betty Ang and her family, it’s not surprising she has made it to the Forbes’ Philippines’ 50 richest list since 2006, when the US magazine reported her net worth at only $115 million. Sales growth is driven by the company’s portfolio of well-known brands, the biggest of which is the Lucky Me! brand of instant noodles. That and its Nissin wafer brand were two of the few local names included in marketing firm Campaign Asia’s list of the 100 most recognizable brands in the Philippines. 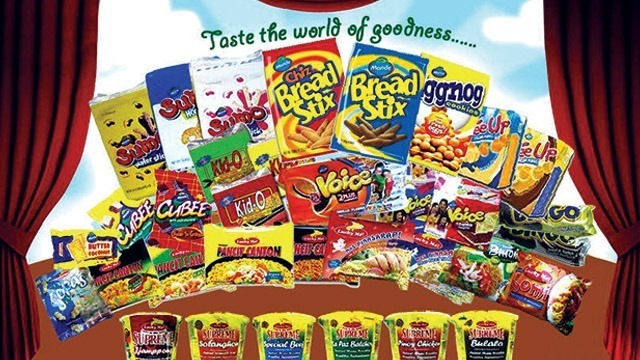 Monde Nissin also owns the cracker brand SkyFlakes and cookie brand Fita through subsidiary Monde M.Y. San Corp, which it acquired in 2002. As well, Monde Nissin has made several acquisitions and partnerships in the last few years. In 2015, it acquired UK-based meat alternatives producer Quorn and Australian food brands Menora and Black Swan. In 2016, it established a joint venture with Indonesian bread firm Nippon Indosari to launch Sarimonde Foods, which distributes packaged bread in the Philippines. On its company website, Monde Nissin claims to have a presence in over 30 countries. In 2015, the company was planning an initial public offering (IPO) worth between $300 million and $500 million, but had reportedly put it on hold. A story from The Philippine Star dated January 26, 2017 said that it would push through with the IPO this year, but nothing has been reported about it since then.